In this review, I will compare two pairs of headphones from JBL. First of them is on-ear Everest 300 and the second is over-ear Everest 700 Elite. Let’s check the differences in design, comfort and sound quality. 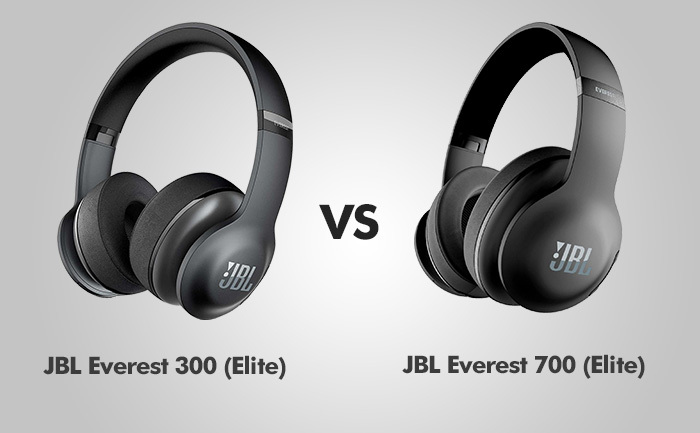 The main difference between these two models is that Everest 300 offers an on-ear and Everest 700 over-ear design. The design is very similar and the differences are hard to notice at first. Because Everest 700 is a bit bigger, it’s also slightly heavier. Build quality of these two models is very similar. They are almost entirely made of plastic with metal inside the headband. They come with a micro-USB charging port and removable audio cable. On the left earcup, there is a volume control, and on the right a power button. Everest 300 is sold in fours different colors: Black, Pink, White and Carolina Blue. Everest 700 comes in two colors: Black and White. Both earcups are adorned with a JBL logo. The cups in Everest 300 can rotate a few degrees in every direction so they will fit any head shape. Because they are on-ear headphones, the pressure on ears is usually stronger than in over-ear headphones. For people who wear glasses, the discomfort is even bigger. The pressure on JBL Everest 700 is much weaker and they are more comfortable, they are still not as comfortable as, for example, HD 800. But it’s not that surprising, they are on the entirely different price level. While Everest 300 offers only passive noise cancellation (Elite version has both), it isolates the sound from the outside world quite efficiently and can be definitely used outside. Everest 300 has a quite expansive soundstage, similar to the open-ear models, which is quite impressive. Bass is great. Like in most consumer headphones, the low tones are boosted a bit, but it’s not that intrusive as in some models from Beats. While the bass is good the treble seems to lack a bit. It’s not as bright as it should be. The bass in these headphones is good, mids are also fine, and there is enough treble to keep the sound from being dull. Similarly to 300, it offers inline mic with a single button remote to control calls, playback and tracks. Plugging the cable automatically disables Bluetooth connection, but you can’t charge your headphones this way. The Elite versions of these headphones offer an active noise cancellation feature. While it’s decent, it’s not as good as Quiet Comfort 35 from Bose, which is the king of noise cancellation headphones. Both models also have a built-in mic, so you can make or answer phone calls. Pairing devices is a simple process. Once you are paired, press the Power button to automatically connect them. JBL offers a cool feature, called ShareMe 2.0. It enables other Bluetooth headphones to connect with yours so you will be able to listen to the same music, movies or video games from one device. The battery in Everest 300 lasts for about 20 hours. Everest 700 can play music for 15 hours with noise-cancellation on and 25 hours if it’s turned off. 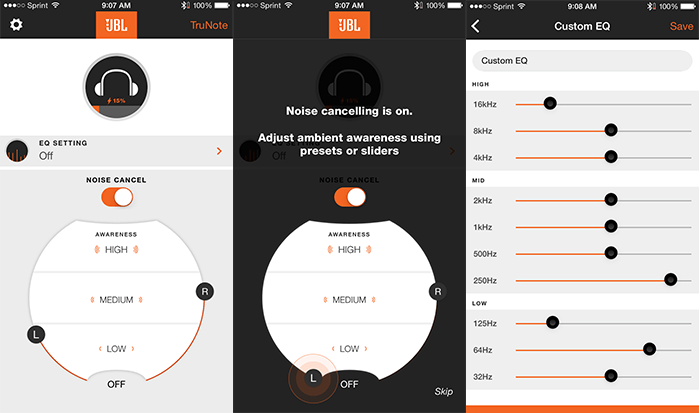 You can download the My JBL Headphones App, which is available for free on Android and iPhone devices. The interface is clean and easy to navigate. The application offers an equalizer where you can tailor bass or treble to your liking, and turn on / off noise cancellation. Another great feature is TruNote custom equalization. Tapping the TrueNote button will initialize the process that will measure the effects that your ears have on audio. This process, that lasts only a few seconds, uses two mics to make sure that the sound signature is optimal to the shape of your ears. If you don’t want to use this feature, you can disable it by pressing both the volume up and down buttons. PROS: Expansive sound / Affordable / Solid wireless performance / Lightweight / Noise cancellation can be disabled / App / A bit of discomfort for people with glasses. PROS: Expansive sound / Affordable / Solid wireless performance / Lightweight / Comfortable earpads / Noise cancellation can be disabled / App. CONS: Average noise cancellation / Limited treble detail. CONS: Average noise cancellation.